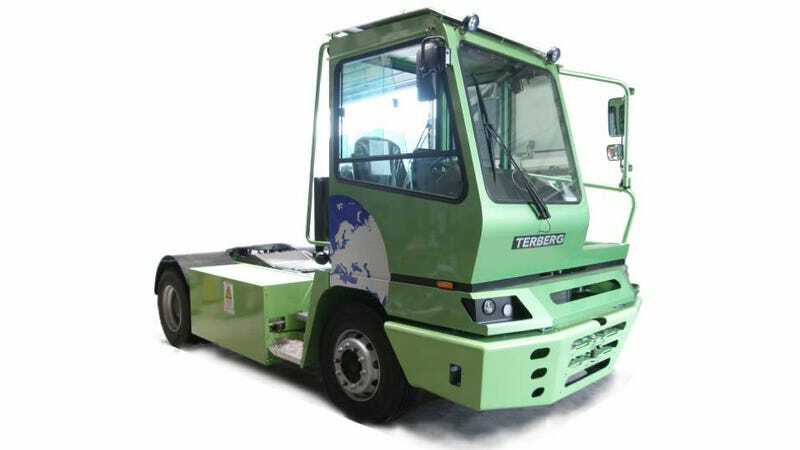 The BMW Group Plant in Munich, Germany will start using a Terberg Type YT202-EV to make daily trips to their nearby shipping hub, cutting 11.8 tons of annual carbon output. They say that's the equivalent of a BMW 320d "driving almost three times around the world." The YT202-EV's motor produces 138 kW of power, which is put to the rear wheels through an Allison 3000 transmission. The truck's gross combined weight max is 65 tons and its top speed is, well, not reported but probably pretty low. It's rated to handle maximum payload at about 12 MPH. BMW's new Terberg will make eight daily 1.2-mile trips between the Munich factory and a logistics outfit called the SCHERM Group, which ships products and equipment all over the world. The truck's being "test run" for one year and its use may be expanded upon if it works out. Andrew P. Collins is Jalopnik's off-road and adventure guy. Shoot him an email at andrew@jalopnik.com or hit him up on Twitter @andr3wcollins to talk trucks.